Greg Rundlett thought booking a road test for his teenage son would be easy. But the first time the Salisbury, Massachusetts, man tried the Registry of Motor Vehicles - he couldn't find a single appointment in the entire state. The next day, one slot did open up - but it was six weeks out and the available RMV branch was far away. "It was in Pittsfield, Massachusetts," Rundlett said in exasperation. "A three-and-a-half hour drive!" The single dad felt forced to choose between taking an entire day off work to drive his teen to Pittsfield or turn the hunt for a better appointment into a part-time job. "I smell a rat," the computer consultant said. "I smell a system that's not helping the people of Massachusetts." In a joint investigation with the New England Center for Investigative Reporting we found a system that favors people willing to pay extra for RMV services while people who can't - or won't - pay lose out. "The Registry takes too long," said Marissa Amidio. "It's ridiculous." The 16-year-old wants the fast-lane to get her license. So the Oakham student is taking advantage of an under-the-radar state program where private, for-profit driving schools get preferential treatment for road tests. For an extra fee, the RMV will often send state examiners to the schools themselves and will test students at exclusive times like early mornings, Saturdays, even Sundays - all scenarios not available to the general public. Said Tim Cooney of the Central Mass. Safety Council, a driving school in West Boylston, "We work hand-in-hand with the Registry. We know, quote-unquote, who butters our bread." CMSC, where Marissa takes her lessons, is one of dozens of schools across the state charging students anywhere from $75 to $195 for the special-access road test. The schools then pay the Registry - a $20 per student "convenience fee." We asked Interim Registrar Erin Devaney, "Isn't that pay to play?." Deveney focused on the school fees instead of the convenience fee saying, "Whatever fees are collected between the driving school and the applicant - is not something that the Registry is a part of." Deveney insists the program is not enabling private entities to profit off a public service and that it is not discriminatory. "Every applicant has the ability to go to a driving school," she said. But we countered not every applicant could afford to pay the schools' fees above and beyond the standard $35 road test fee. "Ultimately, it's up to the applicant how they want to take the road test," Deveney maintained. Deveney says the program - which has brought in more than $4 million in fees in the last five years is a win, win. The schools get dedicated examiners whose overtime hours are paid for from the convenience fees and the state is able to quickly churn through tests because driving schools provide a single pre-inspected, pre-approved vehicle for the students to use. Devaney said, "The more tests we get administered through this program, makes more slots available for other customers who don't participate with the driving school." Nese Lortlar-Unlu wasn't with a driving school and feels like she paid a price when she went for her 9 a.m. appointment at the Watertown branch in September and approached an RMV employee. She said, "He said, you should wait, but we don't know how long." The Turkish doctor says she and another woman waited for more than two hours as RMV staff ushered 20 driving school students ahead of them. "People who paid $100 were taking the test," Lortlar-Unlu said. "They got to cut the line. It's not fair." Deveney insists Lortlar-Unlu's experience was a miscommunication and the RMV is working to improve road test signage at branches. She maintains that the Registry only books driving schools during regular branch hours if there are leftover appointments the general public hasn't swallowed up. But over several days - at different locations - we saw large blocks of driving school students getting tested in the middle of the day - the same time the public is struggling for service. It's hard to imagine that many extra slots just happened to open up. Harder still when you consider state data. Road test applications have jumped from about 3,500 per week to 4,500 in the last decade - while budget cuts have slashed the number of examiners by a third. 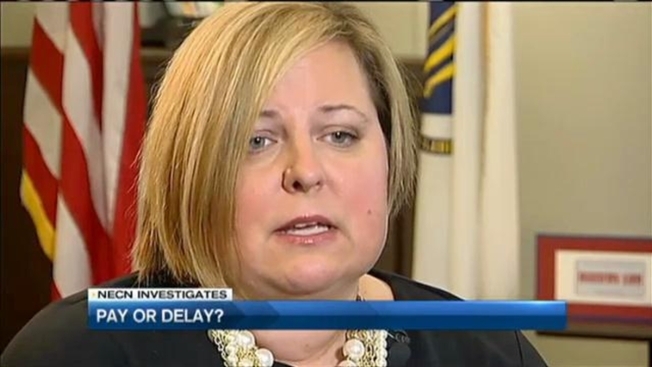 "We're actually in the process of hiring additional examiners," said Deveney. "We recognize that our level of customer service isn't where it could be." Greg Rundlett - who finally found a better slot for his son, closer to home - hopes the new staff will serve everyone. "If you don't play that game, you're kind of stuck." he lamented. "And that's a shame." The Registrar says they hope to increase the number of road test examiners from 39 to 47 - and have already hired three new staffers. She said they are also conducting a comprehensive customer service review to identify any problems of access or other issues - and correct them.